The Plantation Golf Course developers originally owned the Islands behind the Western Idaho Fair Grounds. Greg Jackson, a broadcasting executive of New York City purchased the Plantation Golf Course in 1989 after the previous owners went bankrupt. The Plantation developers had originally intended for the property to be part of the Plantation Golf Course creating two par-four holes. Tee boxes, base for greens and sprinkling system were still there in March of 1990. 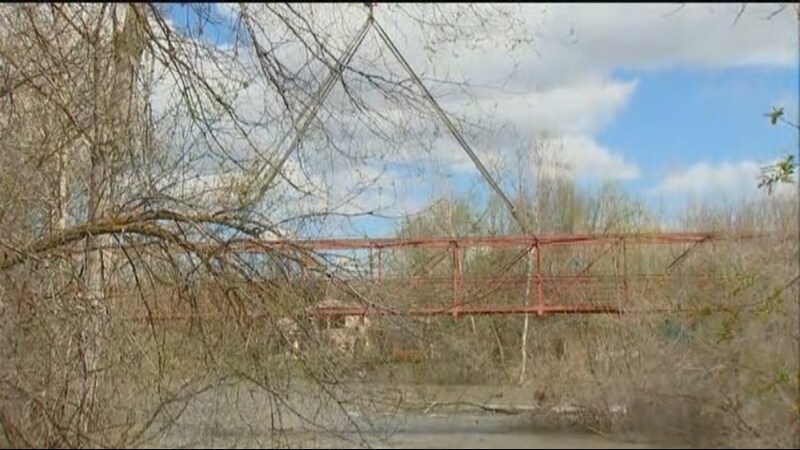 In 1989 a crossing from the north to south side of the Boise River was announced using the Plantation Island as the crossing point; and, as part of a settlement agreement with State of Idaho and Fireman’s Fund, the island was donated to Boise River Trail Foundation by James Gregory Jackson and Sheila Joyce Smith. Bridges were constructed and donated by Ron Yanke, Yanke Machine Shop, and placed on the island on 1990. Ward Parkinson and Jim Nelson, officers of Boise River Trail Foundation, handled the negotiation (successor organization F.A.C.T.S., Foundation for Ada/ Canyon Trail System) for construction and bridge abutments as well as placing the bridges. The bridges designed by B & A Engineers, Inc. were approved on June 28, 1990. In 2012, Boy Scout Troop 94 replaced the wooden planks across both the eastern and western bridges providing a safe, level path for the public in previous years. Spring 2017 flooding caused erosion to the bridge abutments requiring a removal of the bridge.